June 2, 2018, Victoria B.C. 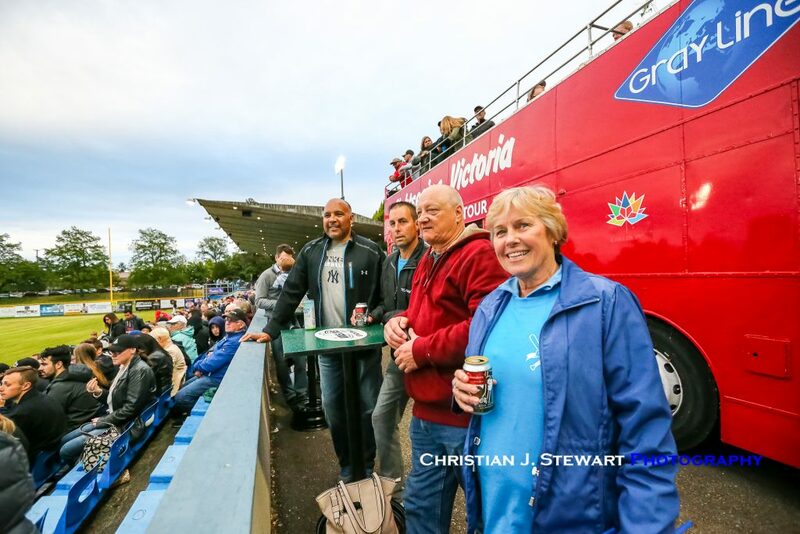 – Someone must have told the Victoria HarbourCat players it was Wilson’s Transportation Fireworks night at Royal Athletic Park tonight. 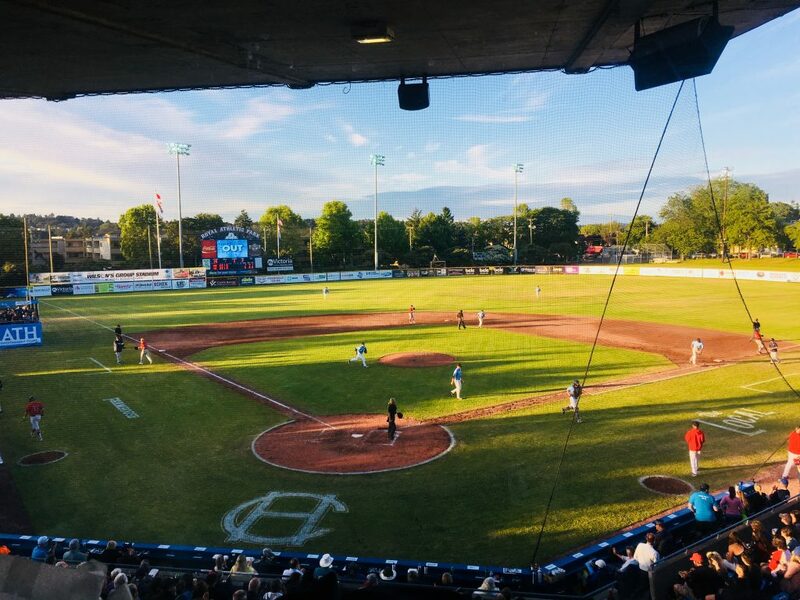 After losing the opener of the series in a low scoring 2-1 pitchers duel last night, the HarbourCats exploded for 10 hits, and 7 runs in a 7-1 win over the Wenatchee AppleSox in front of the largest crowd ever in West Coast League history at Wilson’s Group Stadium at Royal Athletic Park. The 5, 240 paid crowd were witnesses to some controversy early on, as with one out in the first, outfielder Nathan Flores fouled a pitch off his foot, that later rolled into the infield and was called a fair ball by the home plate umpire. Nate Pecota, standing on third, rushed into home thinking the play was indeed live. In fact, even the stadium horn sounded, and the fans at Wilson’s Group Stadium at Royal Athletic Park got to their feet thinking the ‘Cats grabbed first blood. However, the first base umpire would later overrule the call, and after some brief argument Pecota returned to third. 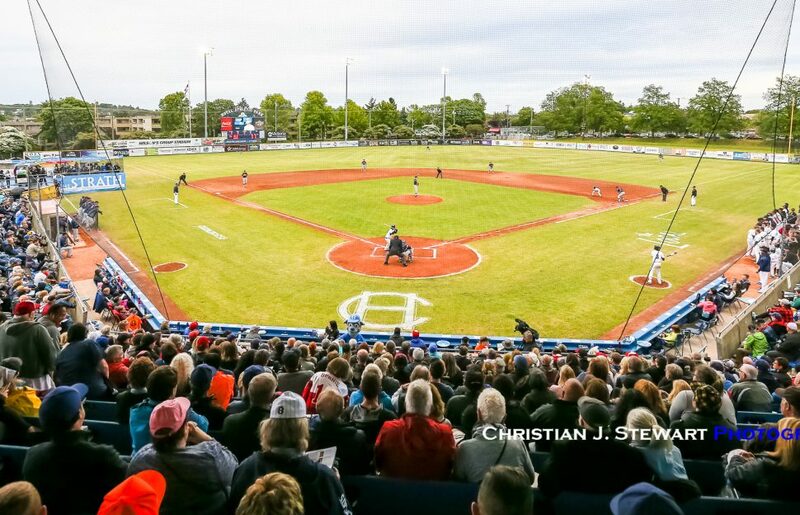 It wouldn’t take much longer for Victoria to grab their first lead of the 2018 West Coast League season, as before fans had a chance to sit down, Flores sent the 3-1 offering from AppleSox pitcher Curtis Bafus to ‘Sox second baseman Nolan McCafferty who threw him out, but didn’t have a chance to fire the ball home to catch Pecota rushing into give the HarbourCats a 1-0 lead. Infielder Jeddediah Fagg, a 6’1” 210lb Georgia Southern university product, doubled the HarbourCats lead with a RBI single on the next at-bat. The ‘Cat onslaught was briefly halted after Jack Smith grounded into an inning-ending double play, but with the help of some shaky pitching from the Wenatchee starter, Victoria poured in two more runs in the bottom half of the second. Bafus, struggling with command all night, hit two batters and walked the bases loaded in the bottom half of the second. 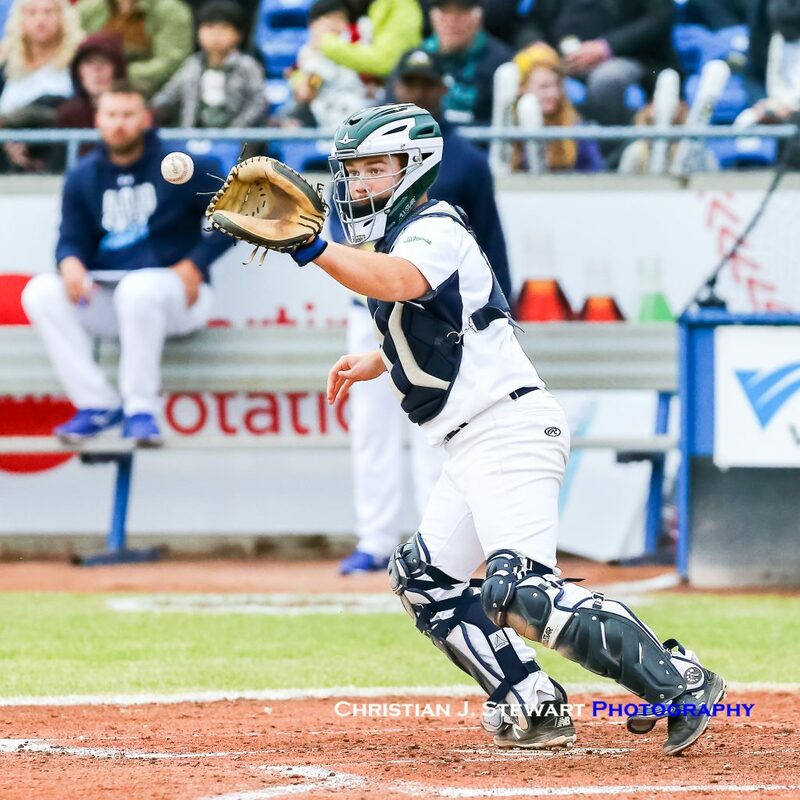 Vancouver Island University native Brodan Bydeweg cashed in on Bafus’ errors, upping the lead for the home team to 4-0 with a two out RBI single. The AppleSox then cut into the Victoria lead with a solo home run from Spokane, Washington resident John Sage in the top of the third. 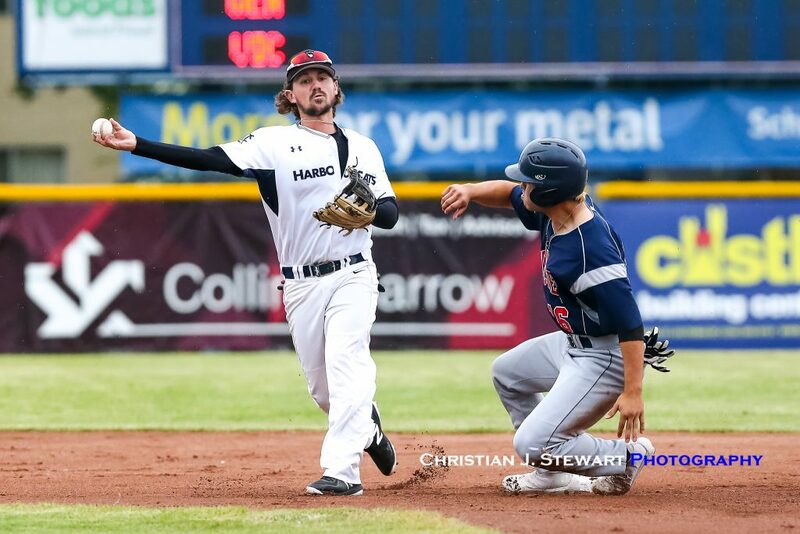 In the fifth inning, with a pitch count reaching close to 100, Bafus walked the first two HarbourCat batters and wasn’t able to get any help from his defence in the field. Infielder Jaxxon Fagg sky rocketed a pop-fly to centerfielder Taylor Poffenroth, and then fired the ball towards home in attempt to catch Smith straying from his bag at third. Poffenroth’s throw was over the head of the catcher, and Smith scored easily, increasing the HarbourCat lead to 6-1. That was all second year manager Kyle Krustnagel needed to see, as he went to his bullpen for the first pitching substitution of the night. Bafus’ was charged with five earned runs, two walks and two strikeouts, over 4 2/3 innings pitched. HarbourCat starter Garrett Goodall went five innings, was only tagged for one earned, and racked up six strikeouts over five full innings. Victoria added one more run in the 6th, and relief pitchers Po-Jui Huang, Tyler Yoshihara, and Po-Yen Chen combined for four innings of one hit baseball, and no runs. Connor Nantkes will make his season debut tomorrow against Wenatchee right hander Hunter Boyd in the first Sunday Matinee of the season tomorrow afternoon at Royal Athletic Park. First pitch of the rubber-match is scheduled for 1:05 pm.